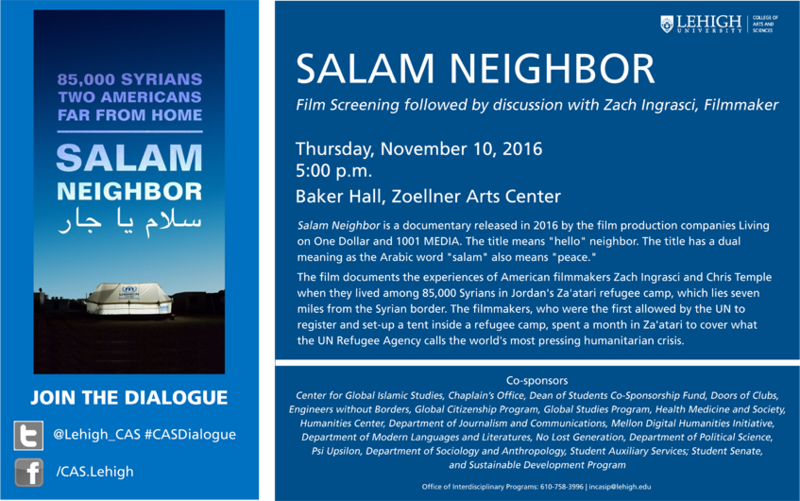 Salam Neighbor is a documentary released in 2016 by the film production companies Living on One Dollar and 1001 MEDIA. The title means "hello" neighbor. The title has a dual meaning as the Arabic word "salam" also means "peace." The film documents the experiences of American filmmakers Zach Ingrasci and Chris Temple when they lived among 85,000 Syrians in Jordan's Za'atari refugee camp, which lies seven miles from the Syrian border. The filmmakers, who were the first allowed by the UN to register and set-up a tent inside a refugee camp, spent a month in Za'atari to cover what the UN Refugee Agency calls the world's most pressing humanitarian crisis. Film Screening followed by discussion with Zach Ingrasci, Filmmaker.